Today is an exciting Lively Show day. 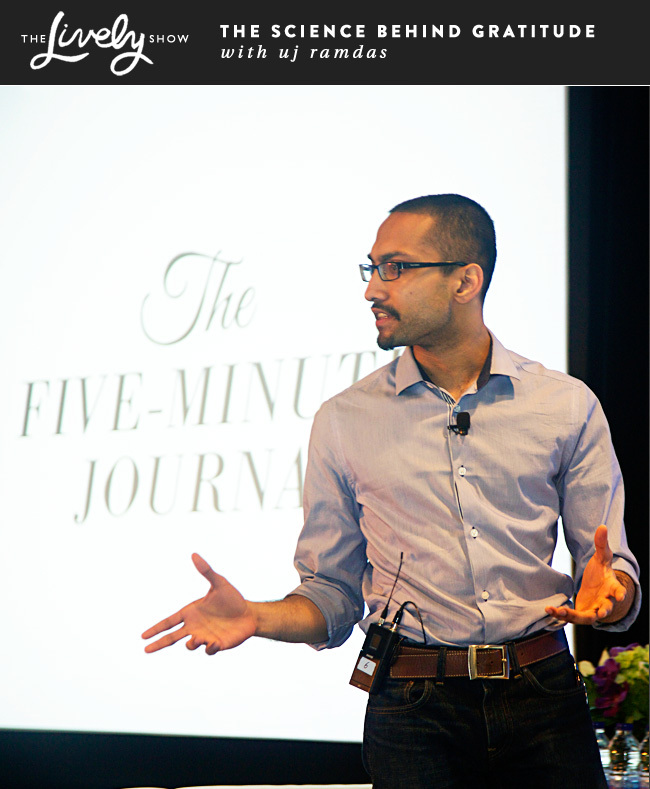 I not only have an inspiring guest to share with you, UJ Ramdas, co-author of The 5 Minute Journal (my new favorite thing! 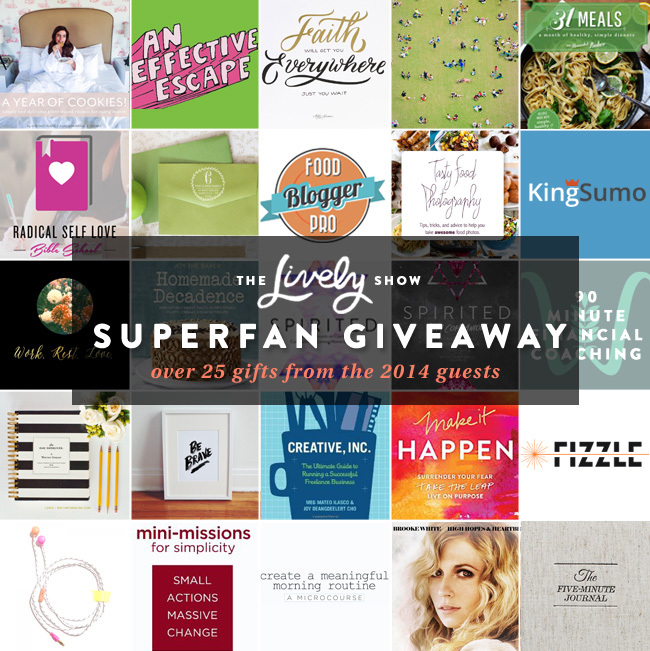 ), but I also have a Lively Show Superfan Giveaway for The 2014 Week of Giving! Today’s Week of Giving giveaway includes items from many of The Lively Show 2014 guests! We’re picking two winners to win the following 25+ items that were generously gifted by the Lively Show guests. We have books, headphones, financial consults, cookbooks, blogging and online courses, prints, and more (see all the details below). UJ Ramdas is the co-author of The Five Minute Journal. He and his friend, Alex Ikonn, created this popular journal with a combination of behavioral science and their own personal wellbeing practices. In the show, we talk about how the journal was designed, UJ’s other favorite ways to start and end his day intentionally, and what he’s learned since recovering from a recent accident in Bali. Scroll below to find out more details about the Lively Show Superfan Giveaway (and how to enter). How studying behavioral change and working in a behavioral change clinic helped set the early seeds for the journal in UJ’s mind. How UJ met his co-founder, Alex Ikonn, of Intelligent Change and co-author if The 5 Minute Journal. The science behind the questions presented in the journal. The one change UJ wished he could make for the journal, that wasn’t agreed up in the feedback he received. UJ’s morning routine and the importance of functional movement. How UJ is processing his near-death motorbike accident. What UJ would tell someone just starting out on this journey. A Year Of Cookies! Jessica’s E-cookbook of delicious plant based cookie recipes. An Effective Escape, Michelle’s Ebook about how she left her corporate job and steps you can take to do the same. Faith Print, An awesome 8x 10 print from an Everygirl Feature with Abby Larson. 31 Meals Cookbook, Dana’s e-cookbook compiles 31 of her healthy, simple and delicious recipes. Radical Self Love Bible School, Gala’s 3 month program to help you unlock your creative side. A custom address stamp made just for you! 1 Year subscription to Food Blogger Pro, a membership site with over 300 tutorials to sharpen your blogging skills and other handy tools + Tasty Food Photography, Lindsay’s ebook all about taking your food photos to the next level. KingSumo.com licenses, access to tech stuff to help your blog grow. Work, Rest, Love art print, a gorgeous inspirational print Esme created. Homemade Decadence, Joy’s second cookbook filled with 125 sweet treats any home cook can make. Spirited and the Spirited 2014 Companion, Rachel and co-writer Tara Bliss ebook with stories of their own and a workbook for you, along with the companion to help you implement inspiration into your own life. A 90 Minute Financially Focused coaching session with Mary Beth to talk through your current financial situation, goals. 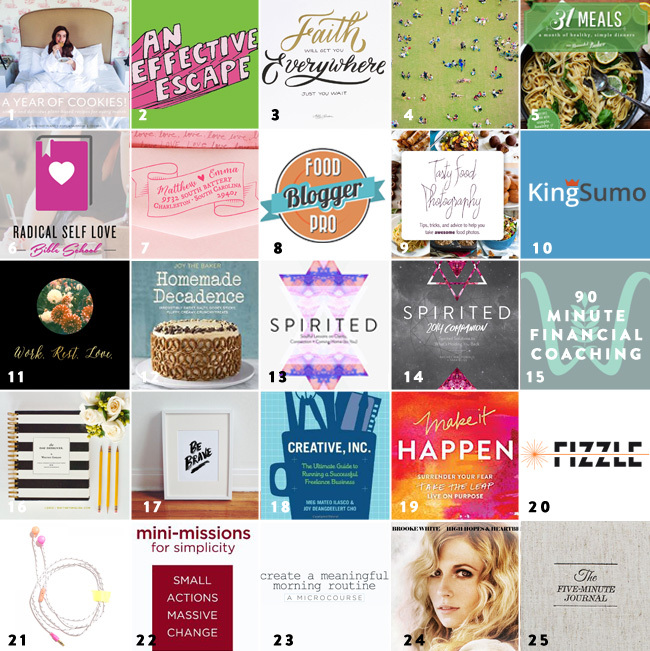 The 2015 Day Designer, a revolutionary day planner created to help you design a life you love. Be Brave Print, A Jess Lively intention print made in collaboration with illustrator Becky Murphy. 18. TLS #33 , Joy Cho of Oh Joy! Creative Inc, Joy’s book on everything you need to know to start a freelance business. Make it Happen, Lara’s book on her journey through perfectly, imperfect life. 3 month Fizzle membership, Fizzle is Jess’ favorite resource for business training and community. Ban.do Ear Buddies, These fun and unique ear buds will have you listening to The Lively Show in style! Mini-missions for Simplicity, Courtney’s ebook on actions you can take to improve your life and her micro-course: How to Create a Meaningful Morning Routine a short course to help you create a morning routine with purpose. Brooke’s CDs: White Christmas, Undercover, and High Hopes and Heartbreak. The Five Minute Journal, an amazing tool to help you anchor your mornings and end your day mindfully. Follow me @jessclively on Instagram. Share a picture on Instagram of where you listen to The Lively Show and tag the photo with #thelivelyshow. You have until Sunday, December 21, 2014 at 11:59 PM CST to post your picture to enter the SuperFan Giveaway. I will be randomly selecting 2 winners and will let you know who the winners are during the show on Tuesday, December 22, 2014.